Are you curious about Jesus Christ and want to learn more about Him? Looking for a place to pray in unity despite diversity? A place to worship in truth and spirit? A place to become more equipped in Word of God? Join us for fellowship and worship which starts at 10am. Enjoy lunch after service. If unable to join, you can watch online by clicking below button. Please come through the side door for direct entry to sanctuary. God used Sam and Christie as an instrument to start the Monthly Delaware Telugu Christian Fellowship and to minister to Telugu people in Delaware. After years in that ministry, Holy Spirit has given them a new vision and direction. The vision is to reach out to unbelievers, equip believers and pray for both. Both Sam and Christie waited on the Lord in every step in establishing this Church. 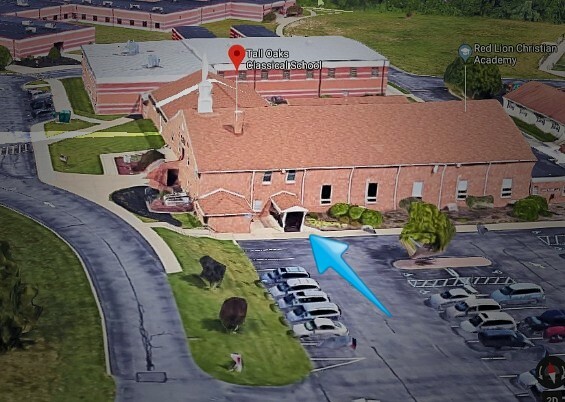 Based on the leading of the Holy Spirit, Grace Gospel Evangelical Fellowship (GGEF) was started in basement of their house in Delaware, depending on HIM to build it. With the encouragement and support from Glasgow Church Pastors and Elders, GGEF started the services at Glasgow Church and became Grace Gospel Church (GGC). We used to meet in Middletown, Delaware at Alfred G. Waters Middle School. We currently meet in main sanctuary of Tall Oaks Classical School of Red Lion Christian Academy in Bear, Delaware on Sundays at 9:30 AM. Church Service begins on Sundays with fellowship at Tall Oaks Classical School of Red Lion Christian Academy in Bear, Delaware. 9:30 to 10:00 – Fellowship. 10:00 to 10:40 – Opening Prayer and Worship songs (3-4 English, 1-2 Telugu, Youth). 10:40 to 10:45 – Short Wisdom Message by Bro. Jonathan. 10:45 to 11:30 – Sermon by Pastor. (Sign up for our email newsletters to receive news, upcoming sermons, previous sermons and more). 11:30 to 12:00 – Communion every first Sunday, Testimonies, Praise Points, Prayer Requests and Closing Prayer. Come, fellowship, and be blessed!